Typography is one of the most important aspects of design. Without it, communicating the right message would be a lot more difficult. However, having a nice typeface in your design does not give the assurance of conveying your message effectively. A good and effective type design takes a complex process that requires the right knowledge and the creative skill of the hand. Our latest featured artist knows well about this in more than a decade of studying and mastering the process of working with letterforms and text. Meet Martina Flor, the Berlin-based designer who focuses in lettering and typography and has been working with type and letterforms for more than 12 years now. Her portfolio is a massive showcase of projects relating to identity, branding, communication design and self -initiated type projects. Her expertise in type design and lettering came naturally after years of studying, teaching and researching within the complex world of typography. In our exclusive interview with Martina, we got the chance to take a peek on how she works on type projects, her creative inspirations and some sound advice that will inspire anyone who has the same passion in typography work. Check out the interview below. I don’t see it, it doesn’t exist…Therefore I advice to show your work as much as you can, put it on the Internet, make it circulate and be part of the creative scene. YTD: Hi Martina, welcome to You The Designer! Tell us something about you and your creative work. MARTINA: I’m a letterer and designer based in Berlin. I was born in Buenos Aires and I moved to Europe to both studying and working. I studied communication design and I specialized in Typography. Now I leave in Berlin where I run my studio and I work for clients around the globe. I also teach type design at the University and I run my own lettering workshops series in and out of Germany called Good Type. YTD: Who or what inspired you to pursue a career in design and typography? MARTINA: I came into it sort of naturally. I studied graphic design and I started combining my skills to draw with the design thinking to express ideas and concepts, therefore it was never about creating a nice picture but about making sense and conveying an idea. Later I specialized in type design and, besides learning to draw specifically type, I discovered that I could get a very powerful impact by working with letterforms and text. That’s how I got into lettering and type design. MARTINA: A friend of mine told me that I’m a freelancer that works as if I was employed in an enterprise. I wake up early, I’m at my studio before 9 am and I work straight until 7 pm. I read newspaper at breakfast and e-mails at the studio. I turn on the music and I start working. MARTINA: On my desk there’s usually white paper, a mechanical pencil and tracing paper. I often use calligraphic tools that are useful to understand the behavior of the tools for a certain project, so I can base my drawings on them. I mostly use a flat nib, a pointed brush and a pointed pen, plus ink. I have my computer and I use an optical pen tablet. YTD: Take us to your usual creative process. From where do you start? MARTINA: I start by writing the initial brief down on a paper, and I write some keywords or attributes that I would like the project to have. For instance: “It should be dark, bold and vibrant” or “I want it to be dynamic and energetic”. These keywords define the first boundaries within which I will work and are useful to work towards a direction and obtaining a certain result. I do very small and rough sketches where I define a basic structure and letter shapes that I’m going to use. And I go from the big picture to the small details, therefore in every iteration I improve features, I change letterforms, I add complexity and I decide upon a color scheme. Once I have solved the main problems and I see that the sketch shows the overall idea I show it to other people, let that be the client for a commercial project or my colleagues and friends for a personal project. That way I can get an early feedback and discuss about it and have more time to work on the next stage, that is usually the digital drawing. After the sketch works, I scan it and I redraw it in digital curves, and the digital drawing develops with iterations of improvement as well. YTD: Enumerate 5 of your most favorite typefaces and why? MARTINA: This is like saying which is your favorite song ever and is something I cannot answer. My taste varies throughout the years, and I enjoy that my interest for things changes. I have to say that although I work with letterforms most of the day, I don’t work with fonts much. My designs are always drawn from scratch and the lettering is always custom. I look at work of my colleagues and other things in the market of course, but I never try to retain their names or to choose for a favorite. YTD: Tell us something about “Lettering Vs Calligraphy”. What is the main goal of this project? MARTINA: It is an excuse to produce more work that could be inspirational for other work we do: design projects or fonts. And the fact that it takes place online turns it into a resource for other people working in the same field. The aim is both making and sharing. Whatever we do in ‘Lettering vs Calligraphy’ is a seed for future projects, a small part of something that could be potentially bigger. YTD: One aspect of typography that you wish clients easily understand. MARTINA: Most of my clients go to me because they understand that typography and letterforms convey a certain set of values and they understand the power of having a custom logotype for their enterprise or having a certain custom lettering for their magazine cover. That is a really great thing about achieving a certain moment in your career where clients trust on your criteria, and they respect your design decisions. Perhaps what they are not so aware of is that drawing type and lettering takes a lot of time, and changing a letter is not about pressing the right key on the keyboard but it implies redrawing the whole thing again. MARTINA: Both! the hand made work is for me very useful to quickly try out some ideas. The digital interface it’s actually a representation of the analog tools, with the plus that we can use cmd+z. That’s wonderful from digital work, that makes us the possibility of trying out things and experiment. I think that digital interfaces are a “new” wonderful tool in our toolbox. MARTINA: This is something I don’t experience much. Perhaps sometimes I realize that a certain project is not going in the direction I want to go, and I take it over again from scratch. I always keep going until I find the right direction, so I guess in my case I just keep working until I get it right. YTD: Any piece of advice to aspiring creative who want to make their way in the industry someday? MARTINA: I always say that if I don’t see it, it doesn’t exist. It sounds a bit radical, but personally it doesn’t make sense to do something if it cannot have an impact on someone or add value to something. Therefore I advice to show your work as much as you can, put it on the Internet, make a blog, use the social networks, make it circulate and be part of the creative scene. Despite social networks might be digital you actually get real feedback from people and I cannot imagine to work nowadays without testing it with an audience. 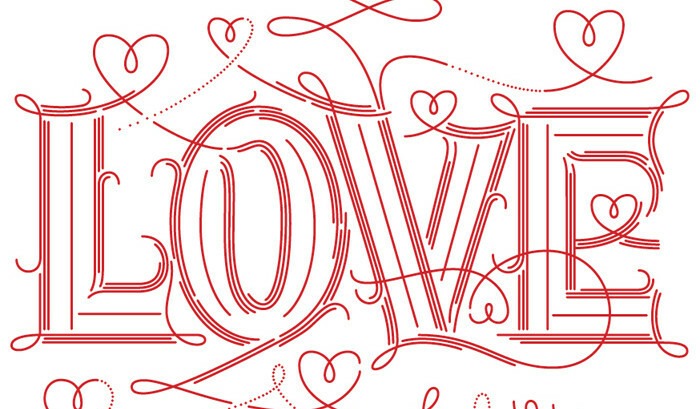 Check out Martina Flor’s official website for more of her awesome type projects. Got inspired? Feel free to tell us your thoughts about our latest featured artist by commenting below and might as well suggest some artists you know and wanted us to feature them in the future.